Facing a growing tsunami of opposition across the country, proponents of nationalizing K-12 schooling through the Obama administration-pushed Common Core education standards regularly claim that the educational “reform” scheme is “state-led.” After all, they are called “Common Core State Standards” (CCSS), and the federal government is prohibited by the Constitution and U.S. law from meddling in what students learn. The reality, however, is that the deeply controversial standards were almost entirely the product of billionaires, the establishment, Obama administration machinations, and an assortment of front groups and trade associations funded by Bill Gates and the federal government. Some 45 states have quietly adopted Common Core — largely owing to taxpayer-funded bribes and waivers from other federal mandates handed out by the Obama administration. This is a companion document connected to the video I made entitled Walking the Labyrinth of the Corporate Owned Common Core. Russlynn Ali, widow of the late Steve Jobs, is Managing Director of the Emerson Collective cited above. The most important thing to know about Common Core national standards is that these standards are NOT new to our government run education system but are just a renaming of an educational philosophy based on a “workforce training” education rather than a classical education where an individual gains knowledge in all subject areas so they can determine their own path in life. 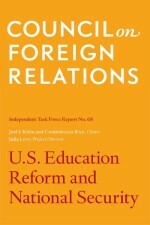 Charlotte Thompson Iserbyt served as Senior Policy Advisor in the Office of Educational Research and Improvement (OERI), U.S. Department of Education, during the first Reagan Administration, where she first blew the whistle on a major technology initiative which would control curriculum in America’s classrooms. -how “school choice” is being used to further dangerous reform goals, and how home schooling and private education are especially vulnerable. -how workforce training (school-to-work) is an essential part of an overall plan for a global economy, and how this plan will shortcircuit your child’s future career plans and opportunities. -how the international, national, regional, state and local agendas for education reform are all interconnected and have been for decades. 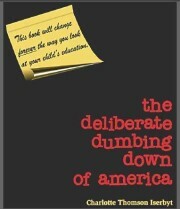 Anyone who truly wants to understand why our nation has suffered a decline in education should read “the deliberate dumbing down of america.” This is a FREE download. Charter Board Partners – D.C. Organization Partners with Teach for America – Obama’s teacher corps to train “master teachers” or “facilitators” to replace current certified teachers who aren’t willing to teach the global curriculum. To amend the Elementary and Secondary Education Act of 1965, AKA: Strengthening America’s Schools Act of 2013 The legislation’s text promoting homosexuality begins on Page 694 of the massive school bill, over 1,150 pages. Here is video of the discussion on this bill creating a defacto national school board by mandating federal guidelines for teacher evaluations based on student assessments, mandating Common Core standards (no longer voluntary), and adding MORE data points to the already massive list of data collected on our children and stored on Google servers, and making Common Core mandatory… not voluntary. The ISNA Core Standards document found below outlines not only their plan for Islamic schools, but for all parochial and Catholic schools as well. 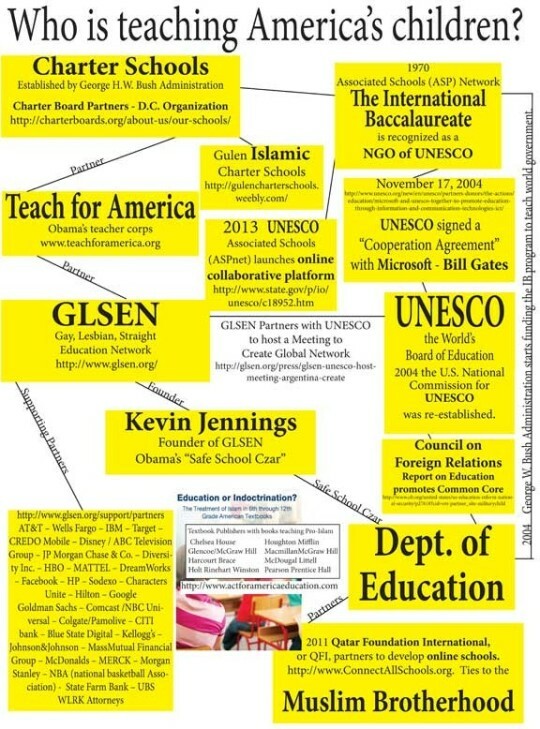 UNESCO was formed with the intention to serve as the world’s schoolboard.